Do You Know The Three Most Important Chord Types In The Major Key And Why? Our focus in this lesson is to highlight the three most important chords in the major key. Beyond highlighting the chords, I’ll also go ahead and tell you why these chords are important and also state their function in the major key. Let’s get started by refreshing our minds on the scale tone chords in the major key. There are 12 major keys on the keyboard and the chords associated with any major key are simply known as scale tone chords. 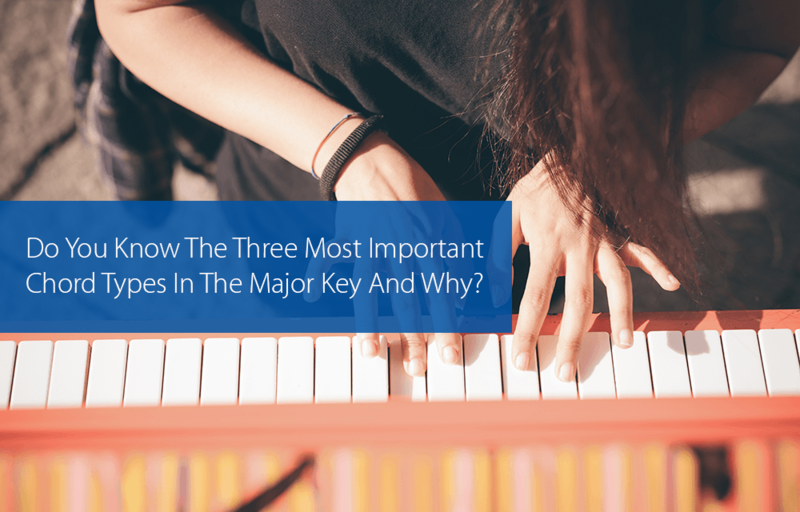 However, we’ll be looking at the three most important chords in the major key. The most important chord in the major key is the major chord, followed by the dominant chord, then the minor chord. …and I’ll tell you why. We’ll be using the 2-5-1 chord progression (which is arguably the most important progression in the major key) as a reference. The 2-5-1 chord progression provides us with the important chord types in the major key from the third in importance (which is the 2-chord) to the second in importance (which is the 5-chord), then to the most important chord in the key — the 1-chord. Note #1. The 2-chord is a minor chord representing MINOR chords which are the third most important chords in the major key. Note #2. The 5-chord is a dominant chord representing DOMINANT chords which are the second most important chords in the key. Note #3. The 1-chord is a major chord representing MAJOR chords which are the most important chords in the key. It’s universally accepted that the 1-chord is the most important chord in the key and this is because it is acoustically the most stable chord, theoretically the chord of the most important tone of the key, and practically the first and/or last chord in most songs. So, the 1-chord is the most important chord in the key and there are acoustic, theoretical, and practical basis for that. Although major, dominant, and minor chords are top three in importance, that’s NOT to say that other chords like the diminished, etc., are not important. In a subsequent lesson, we’ll discuss other chord types other than these top three that you MUST not be without. Meanwhile, I am glad you read this blog post today and I’m doubly sure you learned a couple of things. If you have a suggestion, contribution, or comment, please feel free to enter it in the comment box below. Interesting as always, Chuku! I’ve long considered the most important chords in a key I-IV-V – and if I had to pick a fourth, vi – partly because that covers all the main cadences, but also because they tend to be the most popular chords in pop music. But it’s always good to hear other ideas and opinions!